Ryan offers some great suggestions here for instilling a strong work ethic in Millennials. Introverted leaders, who take the time to listen, coach and build relationships of depth with their teams and customers are uniquely poised to get the best out of their younger workforce. Employers pursue it, leaders exude it, fulfillment is derived from it, customers expect it, success depends on it, and career progression is the result of it…what is it? Workers who view the work they do—fun or not fun, menial or noble—as a critical part of the bigger picture and execute the work with excellence, derive higher levels of satisfaction from their work, unlock more opportunities, and become more promote-able than those content with the minimum effort required. With those type of benefits, why wouldn’t someone want to cultivate a strong work ethic? Work ethic is a value based on hard work and diligence. It’s the principle that hard work is intrinsically virtuous or worthy of reward. In other words, work ethic is not something we are born with, it’s a learned behavior. Work ethic is part of an individual’s personal values and much like a company’s corporate values, they must be taught and modeled daily. We must be careful when comparing a new generation of workers with previous generations when the way in which we work has changed so significantly over the generations. Clearly communicate the expected work ethic. Too many managers make assumptions that Millennials ought to know the expected work ethic. Stop assuming and tell them. Demonstrate the right work ethic daily. Not being innovative and working smart or not having a healthy work-life balance may deter Millennials from following your example. Create channels for work ethic. Ensure Millennials are equipped and have access to innovative tools where they can put their unique skill sets to work. Connect work ethic values to the big picture. The job of a leader is to paint a picture of the preferred future. Help Millennials connect their actions to the bigger picture. Let the customer define the work ethic. The behaviors that Millennial employees need to demonstrate should be defined by the needs of the customers or clients. Reliability – then employees must be available or deliver products/services when or where customers need them. Quality – then employees must do everything in their power to produce high-quality products or service. Honesty – then employees must display integrity in their actions and in every interaction. Professionalism – then employees must dress, act, and prepare like professionals. Positivity – then employees must commit to serving the customer with positivity, friendliness, and enthusiasm. Delighting – then employees must find ways to go the extra mile. Promptness – then employees must be timely in their responses, attendance, and deliverables. Expertise – then employees must demonstrate authority or a willingness to learn. Respect – then employees must be poised, diplomatic, and display grace under pressure. Determination – then employees must embrace challenges and focus on solving the customer’s problem. 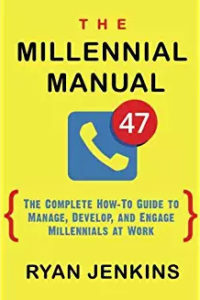 It’s the responsibility of the leader to understand what the customer or client needs and to clearly and consistently communicate the work ethic needed to satisfy those needs to their Millennial employees. Once the customer-defined work ethic has been established, give space to Millennial employees to see how they take ownership and execute the newly formed values. As your customers evolve, so will the work ethic needed to create the best results for customers. This entry was posted in Uncategorized on September 18, 2017 by Jennifer Kahnweiler. Dr. Kahnweiler presented an insightful, eye-opening message to the UWG community at our recent BB&T Lecture in Free Enterprise. Her message to introverts will help students and alumni identify and build on their natural strengths, and her message to extroverts about how to encourage and include ideas from the entire team will build better businesses and better communities!